According to Innova Market Insights data, product launch activity with either a “low sugar”, “no added sugar” or “sugar free” claim, leads the way for soft drinks. In fact, the percentage of product launches per category in the soft drinks space grew from 14.6% in 2011 to 18.1% in 2015, which is a rise of 3.5%. Nick Henson, senior technical manager, Food Solutions at Covance, highlights four key considerations, when it comes to product reformulation for sugar reduction: taste, flavour, texture and calorie management. Calorie management and obesity is the key driver behind government approach in this area. The key factor in sugar reduction is that taste is the most important thing when it comes to beverages and the deliverance of the product, says Henson. “That basic sweet taste of sugar actually controls the balance across other basic tastes,” he explains. “If you have an inherent bitterness or acidity, as you alter the sugar level not only will you adjust the sweetness but you will adjust the perception of the bitterness and the acid. This is an important consideration when it comes to sweetness, so what we are finding is that you might need to adjust other elements of the beverage in order to deliver a balanced product,” notes Henson. “Sweetened products in nature will provide energy,” Henson says. “It’s an inbuilt mechanism to seek out energy sources, the interesting factor here is that if we are providing consumers with sweet products which do not provide energy will they subconsciously seek out energy sources from other elements in their diet. 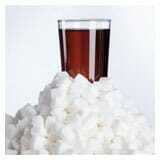 “Sweetness balancing in soft drinks is the easiest task, because there is such a wide range of materials you can use. For flavour, there are so many good materials available that can emulate what consumers are familiar with,” he explains. Interestingly, there are not any known submissions for monk fruit by EFSA, which is surprising and according to Henson that would suggest that it is not on the horizon for Europe for some time. This marketplace obviously presents a major opportunity for all high potency sweeteners. But at the same time as these reformulation efforts, consumers are increasingly focusing on ingredients of natural origin, particularly stevia. In fact soft drinks accounted for 20% of the latest launches tracked by Innova Market Insights that featured stevia. Other natural sweeteners are also increasingly being used in the focus on clean labelling, often in combination with sugar and other sweeteners such as erythritol. Honey and agave are proving particularly popular, and there is also growing interest in the use of allulose….